Last year, in the midst of all the MasterChef Australia hype, our kids got really excited about invention tests. One afternoon, Miss 10 and Miss 11 had picked a whole basket of passionfruits off the vine and experimented. Did your kids get up to any nonsense in the kitchen thanks to Matt, Gary and George? A few weeks ago, we gathered together with friends for a dinner party. One of the highlights for the ladies and kids was trying to make Adriana Zumbo’s macaron tower. 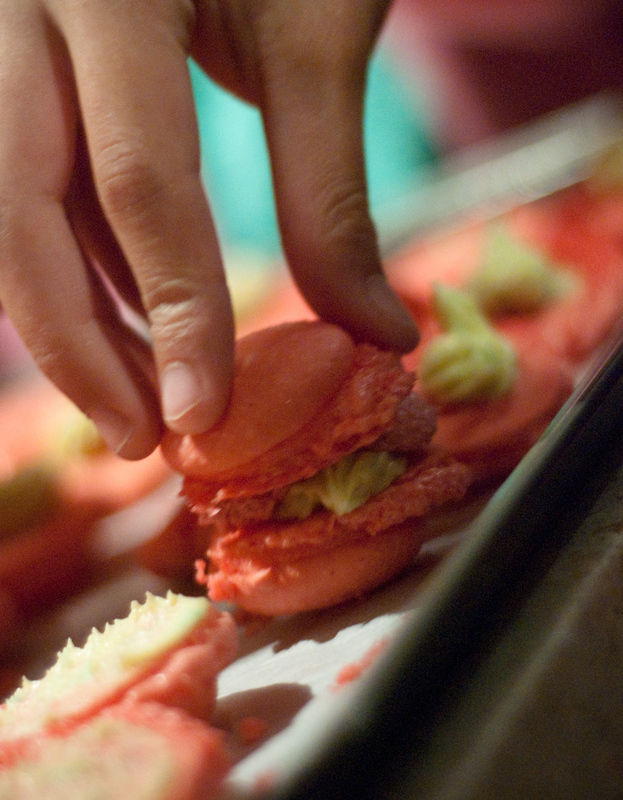 Unfortunately there were difficulties trying to assemble it, so we just had single macaron’s instead! I want to re-use the MasterChef background sounds! One thing that I can’t believe I’m missing now that MasterChef is over is the background sounds. Being musically oriented, it used to TOTALLY BUG me when I watched the show. The motifs used in the show to accompany the action on screen was way too recipe like *boom* *boom*. I can just imagine the musical producers for the show sitting in front of a synthesizer with all the sounds preloaded onto different keys, and then triggering them randomly based on how they feel or react to the action on screen. What a ball of a time they’d have! Imagine using the MasterChef sounds in your own home movie!! Your 6 year old is about to fall off their trike, cue the timpani “boom bada boom boom boom”. And then skip to Mum putting a band-aid on the scratch and kisses and hugs, cue the strings “it’s alright” music. Fantastic! If no-one does this, I’m going to! I want the happy violin music everytime I receive a call. I want the timpani sound for SMS’s or emails. I want it now!! Anyone else want to re-use these sounds? So our family gathered around the box for the grand finale of Masterchef 2010 last night. Although it’s not really a box, it’s more 2D like a rectangle. The kids are already barracking for Adam. Wifey and I have boycotted internet news or social sites so we don’t get any spoilers. Our family is in a good mood after many laughs thanks to Ten’s new import show of Modern Family and about 10 minutes of has-been Dancing with the Stars. First up, basic skills and knowledge. Not good for Callum who has hardly any years of experience. At his age, I was playing Quake and Doom, eating Chicken Treat and McDonald’s and the only kitchen and food skills I had was cooking toast and cereal! Like a quiz show, we’re shouting answers at the TV, but neither Callum nor Adam can hear us. Adam gets ahead. Second, it’s the invention test three ways. Wifey and I look at the end results and think YUM!!! Pork belly is one of our all time favourites. But I’m wondering if Adam really did it 3 ways? Great ad though for a pressure cooker – I’m sure a few thousand people will run into Harvey Norman next weekend to buy one. The judges play chicken and score them both exactly the same. Shouldn’t Callum get more for doing peas two ways? I’m wondering how much collusion there is between the judges outside of what we see. Sometime around now we see the extended Director’s cut special long edition of the Perfect Italiano ad. It brings back good memories, but it’s getting a bit old now. It’s really clever, but not as good as the new “Old Spice” ad. I was hoping for the grand finale they would do something totally different. And then last up, they introduce a special guest chef Peter Gilmore who presents a desert and the girls all go, “What the?”. Channel Ten cut to an ad break, clever cross advertising happens, I reach for the Tivo remote but realise we’ve caught up to live TV and can’t forward anymore. But I wonder why Peter is there – he just loiters around not doing much. Adam cleverly uses him as a lifeline once, but does Callum? Why isn’t Peter judging it? I’m confused. I wonder how much this desert is to order at his restaurant. They present their results to the judges, but it’s not a blind taste test – something not right here. Judges try to make Adam and Callum cry on camera again. I urk as the judges make wonderful comments on the recipe again instead of the execution, the same way judges on So You Think You Can Dance sometimes critique the choreographer instead of the dancer. For the announcement, they bring back all the guest chefs, including Julie. But Miss 9 immediately notices that Adriano Zumbo is missing. Was he miffed that one of his desert’s wasn’t used as the final test? And then it’s all over – there is no way that Adam is going to lose, Miss 9 and Miss 11 are happy. Gary says something about a “glittery kind of Masterchef life”. What is that? I don’t see Julie prancing around in a glittering ensemble? If anything, Poh, the runner up from last year seems to have more exposure with a TV show and even an iPhone app! And then Channel Ten makes a huge mistake – it draws the ending out WAY TOO LONG! They should take a leaf out of So You Think You Can Dance. Get the contestants to have last words, announce the winner, shower all with recycled newspaper or confetti, then end the show there! Instead, they all had to repeat over and over again, “Adam, you are Australia’s Masterchef for 2010!”. Duuuhhhhh! You only have to say that once! But no, it has to keep on going. I look at the clock and it’s nearly 10PM – way beyond the kid’s sleeping time and I’m sure many families will be late for school tomorrow. They bring their families in and more tears flow. Adam’s Dad seems proud, but Wifey and I already have our Singlish accents on saying what’s really in his Asian mind – “Boy, don’t waste your time lah! You are lawyer, lawyers earn good money and work guaranteed for life wannnn”. Callum gets consolation prize at the Press Club. No iPhone app? One thing Wifey and I noticed missing – no thank you from Adam to the judges, other competitors, celebrity chefs, producers, etc. Was this edited out? Finally, Wifey and I breathe a sigh of relief. No more Masterchef TV for a while. Except the kids are super excited about the Junior Masterchef series coming on soon. Channel Ten are too clever. With the World Cup soccer finished, Tour de France over and Masterchef over, I’ll be glad for some PlayStation 3 gaming time now! OK, I started getting adventurous and wanted to try a MasterChef recipe. I love apples, so I couldn’t go past the Apple Tarte Tatin. One problem was that I’ve never ever cooked apple. Actually, I think a bigger problem is that I’ve never eaten Apple Tarte Tatin in my life either. What is it meant to look like.. or what is it meant to taste like? Cooking the apples was no problem. But I started wishing I had one of the MasterChef judges near me when I had to put the pastry on top. Was I doing it right? Putting the whole pan into the oven was certainly a novelty for me. I had visions of my cheap pan melting or the handle breaking off, but luckily it was fine! It certainly looked nice when it was cooking. But the true test was when I flipped it. The kids had a taste but didn’t like it at all.. but I managed to gobble down half of it before I was too full. I think I’ll have to try this one again another day. Our family has recently got hooked on Masterchef. The kids are really getting into it, looking forward to each night’s show. This show has really inspired our little Miss 8 to cook. On the weekend, she put on her apron and, in the spirit of Masterchef, cooked up her own unique creation using ingredients available in our fridge and pantry! I asked her what the name of her dish is, but she just shrugged. So we made one up for her, Caregg! As you can see from the photo, this dish consists of a centre of scrambled egg on a base of grated carrots. The deep red sauce is a unique combination of straight ribena infused with freshly squeezed lemon juice. To complete the dish, it is drizzled with raw egg white and sugar and garnished with chopped lettuce. I’m sure there’s a few other things in there like tomato sauce and heaps of butter. I love Miss 8’s attention to presentation. As they say on Masterchef, you eat with your eyes, and Miss 8’s Caregg dish was beautifully presented! The challenge now is to cultivate this interest in cooking!